The Thursday Free Practice sessions from the Iveco TT Assen were action packed and full of surprises, with Jorge Lorenzo topping the dry morning session before breaking his collarbone in the afternoon, and Marc Marquez finishing half a second ahead of the rest in the wet FP2 session. Lorenzo took the early lead in FP1 but was toppled by Marquez fifteen minutes in; the reigning champion regained his position ten minutes later going seven tenths ahead of everyone else, despite being nearly two seconds off lap record pace. After late charges from Crutchlow, Marquez and Rossi, Lorenzo finished the session over three tenths ahead the trio, respectively; they were followed by Pedrosa, Espargaro on the CRT, Bradl, Bautista, Pirro who is still filling in for Spies on the Pramac lab Ducati, and Smith rounding out the top ten. A full list of times from FP1 (the overall times for the day) are found below the jump. The heavens opened on the TT Circuit Assen prior to FP2, making it one of the only well and truly drenched free practice sessions at a grand prix this year. This lead to an incredibly action packed session, so much so, that PaddockChatter is struggling to think of the last time a free practice session, or any session for that matter, had so many position changes throughout the timing sheets over the course of the 45 minutes. 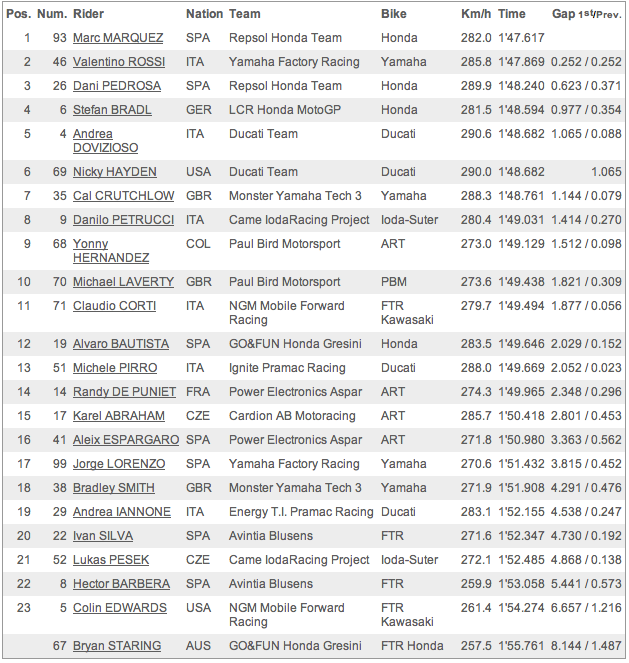 Pedrosa lead the way after the first fifteen or so minutes, followed by Bradl, Marquez and Crutchlow. With the prototype riders adjusting to the tricky conditions, many CRT riders with their reduced engine power were able to take advantage, putting their names firmly inside the top ten throughout the session. The PBM duo of Hernandez and Laverty found themselves in the top ten for the majority of FP2, even sitting as high as fourth with half an hour left on the clock. With 25 minutes to go, Jorge Lorenzo aquaplaned on his M1 Yamaha while turning into the monstrously fast turn thirteen, sending him tumbling through the air landing and heavily on his left shoulder causing what are reportedly two clean breaks to his collarbone. More info on Lorenzo’s condition can be found here. Whilst attention was focused firmly on Lorenzo, Aleix Espargaro topped the timing sheets ahead of Marquez, the down and out Lorenzo and Cal Crutchlow. The Spaniard was replaced a short while later at the front by none other than fellow CRT rider, Claudio Corti, who at one point found himself nearly half a second quicker than his compatriot Valentino Rossi who had slyly moved his way up the order from 12th to 2nd. With ten minutes left on the clock, Espargaro was the second rider in the session to crash, this time a far slower incident at turn ten. Like Lorenzo following his get-off, Espargaro immediately clutched his wrist causing worry of an injury to the current CRT title leader. However, after an examination at the medical centre, the Spaniard was deemed uninjured despite the discomfort. Meanwhile, Corti was relegated down the order by Marc Marquez with five minutes left on the clock along with Bradl, Crutchlow and Dovizioso. This left Corti, Rossi, Pedrosa, Hernandez, Pirro and Abraham rounding out the top ten, before the Czech (somewhat characteristically) sent his ART into the tyre wall. With the session coming to an end, the name at the top of the timing sheets changed no less than six times, first with a fastest lap being set by Crutchlow, followed by Bradl, Dovizioso, Rossi and then Pedrosa, who went a quarter of a second faster than Rossi as the chequered flag came out. 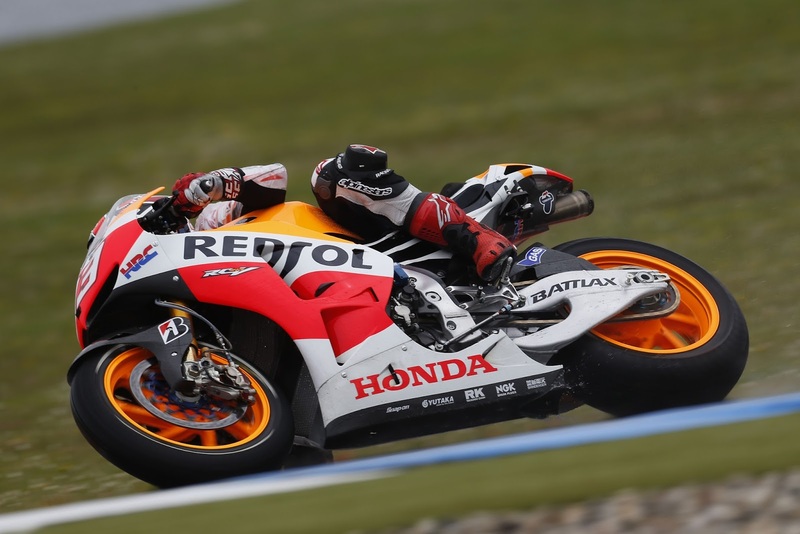 Pedrosa’s delight was short lived however, as his rookie team mate, Marquez swiftly snatched away the top spot by six tenths of a second in a last lap dash as the majority were on cool down laps. An impressive lap by Marquez? Of course! Surprising? Not anymore. Following a final flying lap from the remaining factory Yamaha, this meant that Marquez finished the session on top, followed by Rossi, Pedrosa, Bradl, Dovizioso, Hayden, Crutchlow and CRT boys Petrucci, Hernandez and Laverty rounding out the top ten positions. A list of times for FP2 can be found here. However, the fastest times of the day were set in FP1, meaning that it is Lorenzo, and therefore actually, Crutchlow who leads the the timing sheets into tomorrow morning’s FP3 session. The weather forecast for tomorrow is also looking rather bleak, with light rain forecasted for the morning. This could mean that the times from this morning’s FP1 are those that will be used to decide who is seeded to Q2 and which prototypes will be circulating with the CRTs in Q1. For the moment, given that Lorenzo is out of the GP, Andrea Iannone would be the sole prototype representative in Q1 with fellow Ducati man, Nicky Hayden scraping through by the skin of his teeth. Previous Previous post: Rossi: "Its been a postive day for us"
Next Next post: Lorenzo breaks collarbone at Assen: "I think I was too confident"